On October 20, President Barack Obama announced the 2014 Tribal Nations Conference via an official press release. This December 3rd event will mark the sixth White House Tribal Nations Conference held under the Obama Administration. Selected representatives from each of the 566 federally recognized Native American tribes will meet at Washington D.C.’s Capital Hilton hotel to discuss relevant issues with President Obama and members of the White House Council on Native American Affairs. In June, the President paid a visit to North Dakota’s Standing Rock Indian Reservation during the annual Cannon Ball Flag Day Celebration. Obama’s appearance stands as the first presidential visit to a reservation since Clinton’s in 1999 and the third presidential visit to a reservation in all of our nation’s history. The focus of this visit, prospective educational and economic development, has been carried into current White House affairs. A tentative improvement plan pertaining to the Bureau of Indian Education’s control over 183 schools on Indian reservations is currently in place. If this plan goes through, tribes are said to gain greater sovereignty over the facilities on their land. We are excited to see what progress is made at the 2014 White House Tribal Nations Conference and will report more after it takes place. 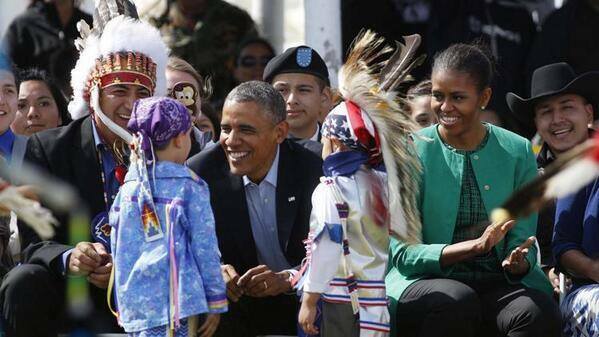 Tell us what you think of Obama’s efforts toward improved tribal relations. Has the President done enough? Too much? He cares nothing for no one. Its about time they are helping the native american people. Ive been praying for this day to come. for native american peoples voice to be heard. I am native american and there is alot that needs to be done for my people. only people knew what goes on the reservations. it makes me sick how my family had lived on the reservations for so long. This is long over due fir sure. The sovereignty isnt what sovereign if the government is still acting like the indigenous are not capable of running themselves. They been doing it from the beginning of time. The US gov. Used our forms of the true pratice of sovereignty . Although some tribes may need assistants in some ares of ther infrastrurce many have surpassed many of the surrounding cities but are being surpressed by the states gov. Wanting a share of the tribal interprises. This is nothing more than poorly ran state goverment. The federal government isnt any different. Release Leonard Peltier from prison that might be the right step for people to listen. There is a lot of complaining going on here. Makes wonder if these people realize that the president is not a king and cannot rule by decree. Seems to me your beef is with congress and specifically Republicans, who have blocked every proposed initiative the president has offered. You’ve got to know who your friends are and who they aren’t.